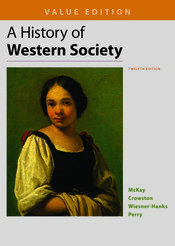 Praised by instructors and students alike for its readability and attention to everyday life, A History of Western Society, Value Edition offers the full narrative of the parent text in a two-color, trade-sized text with select images and maps at an affordable price. This edition includes many tools to engage today's students and save instructors time, five chapters devoted to the lives of ordinary people that make the past real and relevant, and the best and latest scholarship throughout. Enhanced with a wealth of digital content in LaunchPad, the value edition provides easily assignable options for instructors and novel ways for students to master the content. Integrated with LearningCurve, an adaptive online resource that helps students retain the material and come to class prepared.